General government EDP debt, or consolidated gross debt at nominal prices, totalled EUR 135.1 billion at the end of the first quarter of 2018. From the previous quarter, debt decreased by EUR 2.1 billion. 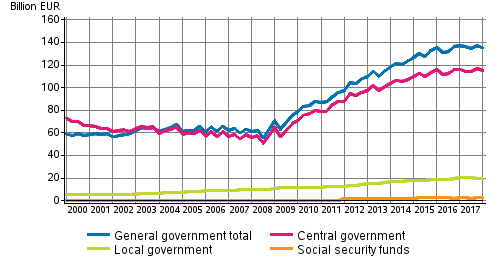 These data derive from Statistics Finland's statistics on general government debt by quarter. Central government debt decreased by EUR 1.9 billion in January to March and was EUR 115.1 billion at the end of the quarter. During the first quarter, the net amount of short-term debt instruments with a maturity of under one year decreased by EUR 4.4 billion due to amortisations, the stock of short-term loans by EUR 0.1 billion and the amount of cash deposits by EUR 0.2 billion. The stock of bonds grew correspondingly by EUR 2.7 billion during the quarter due to new emissions. The local government debt sector's decreased by EUR 0.3 billion and totalled EUR 19.4 billion at the end of the quarter. Both long-term and short-term loans went down by EUR 0.6 billion, but the stock of money market instruments grew by EUR 0.3 billion. In addition, the amount of short-term loans of social security funds decreased by EUR 0.3 billion due to the decline in cash collateral received in connection with employment pension schemes' derivative contracts and securities lending. ISSN=1799-8034. 1st quarter 2018. Helsinki: Statistics Finland [referred: 24.4.2019].